We all have been in meetings where you have written these great ideas on a white board and then we lose the information. Sometimes, we take pictures of the board and then share them with the team; sometimes we don’t know who has what information or what photos and information gets lost in the cracks. Or maybe it’s a ‘Do Not Erase!’ note to everyone else that enters your meeting space…but it gets erased anyway. But what if you could save it with just a simple stroke of your mobile? No headaches. No tracking the photos so-and-so took down to copy the information into a shared document for your team. No hassle. Much like the pano photo setting on the iPhone, we created MURAL Scan that helps with keeping the creative juices flowing and ensuring that no brainstorming session gets lost again. It acts as a bridge between the physical and the digital. 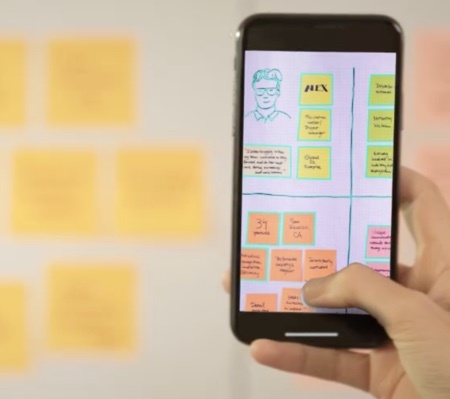 Scan can detect sticky notes, strokes, and sketches – basically, whatever you create on your white board can transfer over into a digital version inside MURAL. From there, you can then share the MURAL with your teammates by invitation. You do not lose the flow and you have every note there for your record; you can go back and edit a thought or expand on an idea. This keeps your team running on all cylinders with little to no disruption.